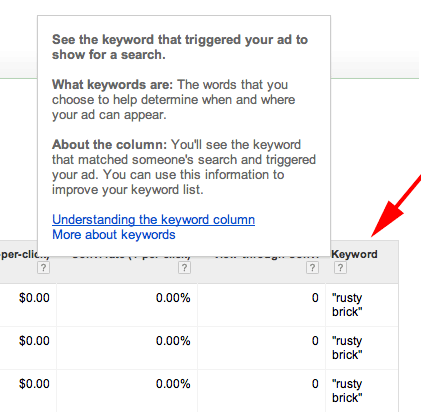 The added column lets you see the keyword that triggered your ad to show for a search. This column helps you see the keyword that matched someone's search and triggered your ad. You can use this information to improve your keyword list. Googler, Jon Diorio, explained this new column gives you "finer-grained data on expansions." To add it to your reports, On campaign tab, go to keywords . Under keywords details, choose "All". In the "columns" drop-down menu, click on "customize columns". Under "metrics" select "attribute", and click on "keyword." This seems incredibly useful to marketers. Forum discussion at Google AdWords Community.